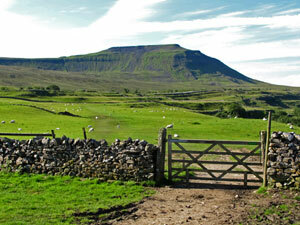 The classic Yorkshire Three Peaks Walk is a very demanding but rewarding walk, which takes in the summits of Pen-y-ghent (694 metres - 2,276 feet), Whernside (736 metres - 2,415 feet) and Ingleborough (723 metres - 2,372 feet) all in one circular route. 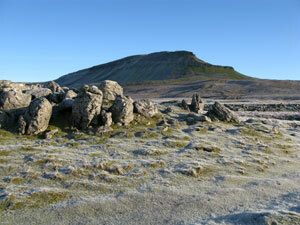 There is no set starting point, but the vast majority of walkers start at Horton in Ribblesdale, taking in the summits in the order shown above. The walk is 24.5 miles (39.2km) long and takes in approximately 5,000 feet (1,600 metres) of climbing. The walking is over a variety of terrains and the paths, especially over the previously boggy sections, have been improved immensely over recent years, work undertaken by the Yorkshire Dales National Park Authority. We have split the walk itself in to three sections so that you can either download the full walk (recommended if you have never walked the route before) or any individual section. The walk lends itself to be split in three and if you have support crews to help you on your walk, the end of each section is an ideal place for the support crew to wait. Besides the video, you also receive full written walk directions and the route marked on 1:25,000 OS mapping in a PDF file to print or view on your mobile device. 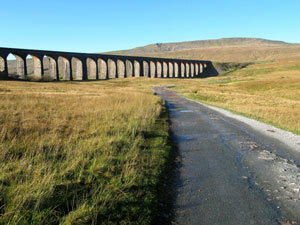 We have also written an essential 25 page guide to completing the Three Peaks Walk - follow the above links for details.